Northern Switzerland contains a true cornucopia of attractions and many of the most popular lie close to Basel, being best explored as part of a day trip. 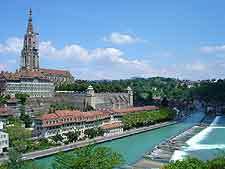 Situated around 95 km / 59 miles south of Basel and home to a population of around 180,000 people, the city of Berne is famous for its medieval centre and related attractions, and ranks as a World Heritage Site. 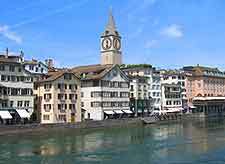 Another prominent city and leading financial centre to boot is Zurich, only 51 miles / 82 km east of the city and filled with interesting sights to see and savour. For something quite different, take time out to visit the Black Forest, which lies between Schaffhausen and Basel, and gained its name from its dark-green canopy of large evergreen trees. 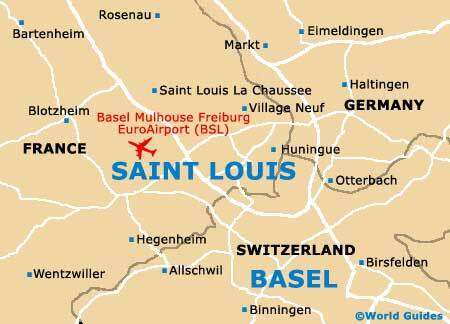 A buzzing and famous Swiss city, Zurich is home to a population of almost 400,000 people. Zurich is situated on the northern side of the Zürichsee and boasts a series of historic alleyways, flanked with houses from both the 16th and 17th centuries. 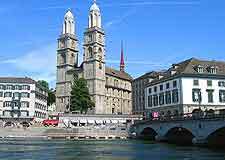 Old Town Zurich contains the majority of the most visited attractions and is divided by the River Limmat. Look out for the Linderhof, an ancient raised terrace of the western bank of the Limmat, used by the Romans over 2,000 years ago. Berne is actually Switzerland's proud capital city and its many curving, cobblestone alleys and streets are lined with endless 15th-century townhouses. Attractions to look out for include the clock tower known as the Zytglogge, the city's splendid Gothic-style Münster cathedral, the Rosengarten (Garden of Roses) and the exceptional shopping promenade, which is covered and amongst the longest in Europe. Known for its endless hiking trails and recreational attractions, the Black Forest is the true home of the Swiss cuckoo clock and was also the actual setting for the world-famous story of Hansel and Gretel. Frieburg is considered to be the capital of the southerly region of the Black Forest and is home to a grand cathedral, which presides over the adjacent Münsterplatz. Other notable towns and villages within the Black Forest include Freudenstadt, Furtwangen and Triberg, where the Wasserfälle (waterfalls) have become a much photographed sight. Situated on the westerly side of Lake Lucerne and around 57 miles / 92 km south-east of Basel, the city of Lucerne straddles the meandering Reuss River and features many medieval attractions within its historic Old Town centre, particularly around the Kornmarkt and the Weinmarkt. 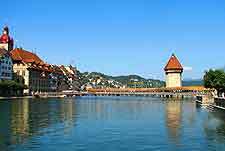 One of the main attractions in Lucerne is without doubt its ancient city wall (Museggmauer), which you are able to freely walk along during the summer months and enjoy its many exceptional vantage points. A stroll along the Chapel Bridge (Kapellbrücke) is also very much a must. Although the town of Mulhouse is actually located in the Alsace region of eastern France, it is a mere 23 miles / 37 km to the north-west of Basel and makes for a very popular day trip. Within Mulhouse you will find the marvellous Musée National de l'Automobile, where you will find some 400 rare and unusual motorcars from all over Europe, a number of which date back to the 1870s and 1880s. On a similar transport theme, the Musée Français du Chemin de Fer displays an enormous collection of steam locomotives and railway carriages.